(a) Commodity Boards look after the export promotion of primary and traditional items of exports, While Ex Promotion Councils look after the export promotion of non-traditional items like engineering goods, computers, chemicals, etc., with promising export potential. (b) While EPCs are export Potential, statutory bodies. registered under the Companies Act, Commodity Boards are statutory bodies. 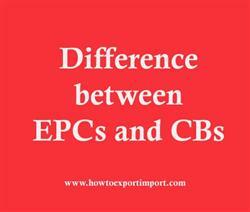 (c) EPCs are concerned only with the promotion of exports of their respective Products; the scope of Commodity Boards is much broader. The functions of Commodity Boards also encompass the development and production of the respective commodity and domestic marketing.